After twenty plus years of traveling to many destinations around the globe, I can claim with confidence to be an expert packer. Most people throw some things into a suitcase and when they can get the zipper shut are satisfied with their accomplishment. However, in this day and age where the airlines become bolder every day with charging baggage fees and the carry-on limits are steadily increasing, it is in the traveler's interest to be a vigilant packer. The best way to do this is to "plan your pack." What I mean by this is that you need to start thinking about what you want to take not a day or week ahead of your trip, but actually several weeks. One of my pre-international travel packing rituals is to place a cardboard box in a non-traffic corner of my living room and every time I come across something I need to take, I toss it into the box. What about those Dutch stroopwafels and dark European chocolate my friends and relatives in the U.S. have been begging me for? Throw them in the box. My squishy earplugs for the loooong transatlantic flight? Throw them in the box. Passports? Check. By the time my travel date nears, I am ready to begin my stress-free pack confident that I'm not forgetting anything important. 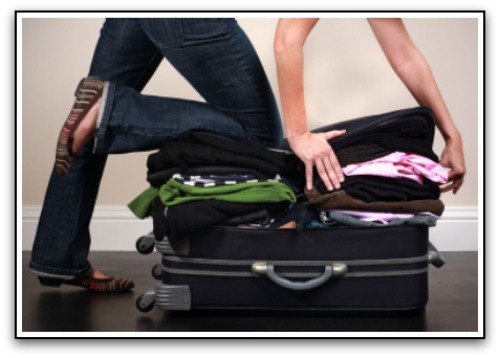 See if you can save money on your baggage fees by checking-in online. Most airlines offer lower baggage fees if you reserve them in advance by checking in online. Do you have additional ideas for more efficient packing? Please post them below.